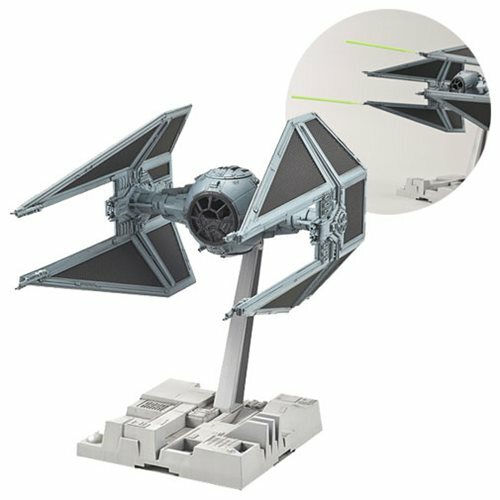 Featured in the Star Wars movie Return of the Jedi, the infamous TIE Interceptor has been faithfully recreated in 1:72 scale as this incredibly detailed plastic Star Wars TIE Interceptor 1:72 Scale Model Kit that measures about 9-inches long. Bandai's trademark color injection process allows for construction of highly detailed parts that are color molded, reducing the need for paint. The set includes a dedicated display base, 2x laser-effect parts, a seated pilot(unpainted), x2 view ports, a water-transfer decal, a marking sticker, and 8x runners. No glue is required, but a nipper or sprue cutter (sold separately) is needed for assembly. Ages 15 and up.